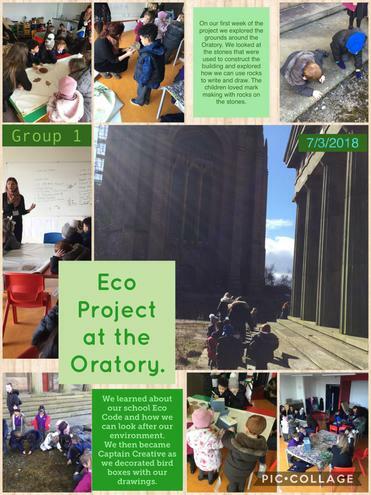 On Wednesday, the final Reception group took part in our Eco Project at The Oratory. We thought about the importance of having green spaces in our city. We also made observational drawings of flowers and took our drawing outside to The Oratory where we made rubbings and sketched our environment. 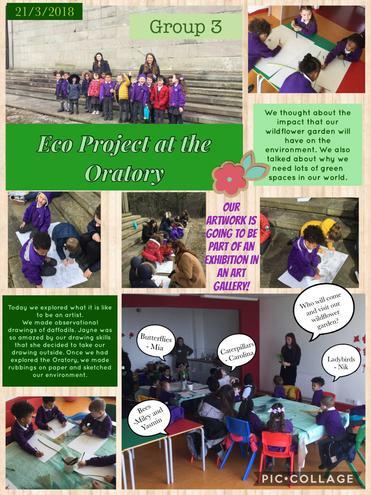 All of the Reception children have thoroughly enjoyed participating in the Project at The Oratory. We loved finding about our school Eco Code and why it is so important to look after our world. During our sessions, the children all created their own sketches and artwork. Our Artist in Residence, Jayne Seddon, was so amazed by the quality of our work and she would like to include them in an exhibition that she is developing in art gallery and during 'Light Night' which is taking place at The Oratory on May 18th. We will pass on more information about these events nearer to the time. We have been so proud of our Reception children throughout this experience. They have demonstrated such enthusiasm towards the project and have shown a real love of learning.